Our motorcycle foot pegs are all have one piece mounts - a strong, simple design. 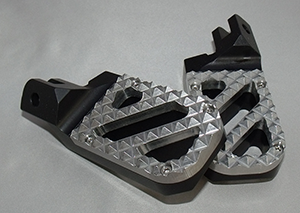 Wide pegs for street, dual-sport and off road bikes, with a tread 2 inches across by 3-3/8 inches long (51 mm x 86 mm). The wide pegs have the extra tread toward the back of the bike. 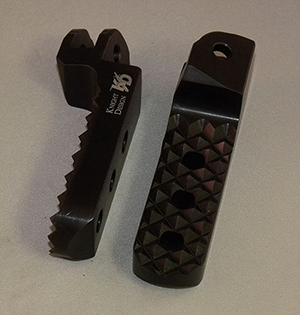 Wide pegs come with a choice of two interchangeable treads. Overall length of the pegs varies with the amount of drop and mount required for your bike; most pegs are 5 inches (127 mm) in overall length. We make each foot peg from solid 7075 or 6061 heat treated aluminum (extra-high strength alloys, sometimes called aircraft grade billet aluminum). Because these parts are aluminum, they do not rust. 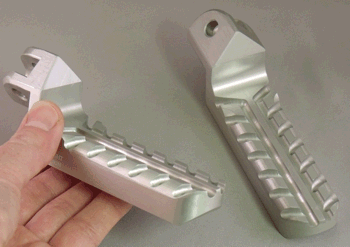 All wide foot peg treads are machined from extra-high strength 7075 aluminum. We sell all our foot pegs in pairs. All our parts are made in the USA. 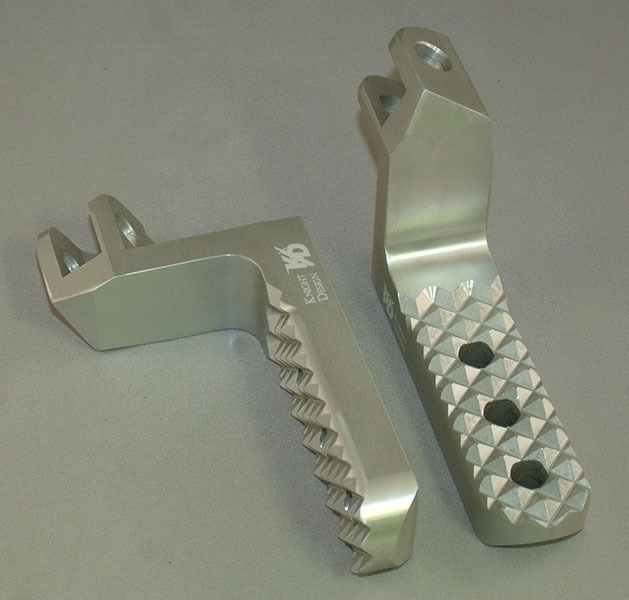 We make foot pegs that come straight out of the mount, as well as models that lower your foot up to two inches or more. 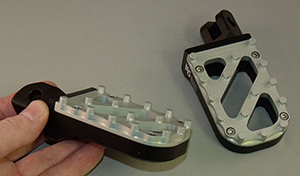 For each model of bike, we list the height the foot peg will sit on your bike with respect to your stock foot pegs. We offer three tread options for street bikes, and two for street, dual-sport and off road models. They're shown at right. Click on the pictures for a larger view. 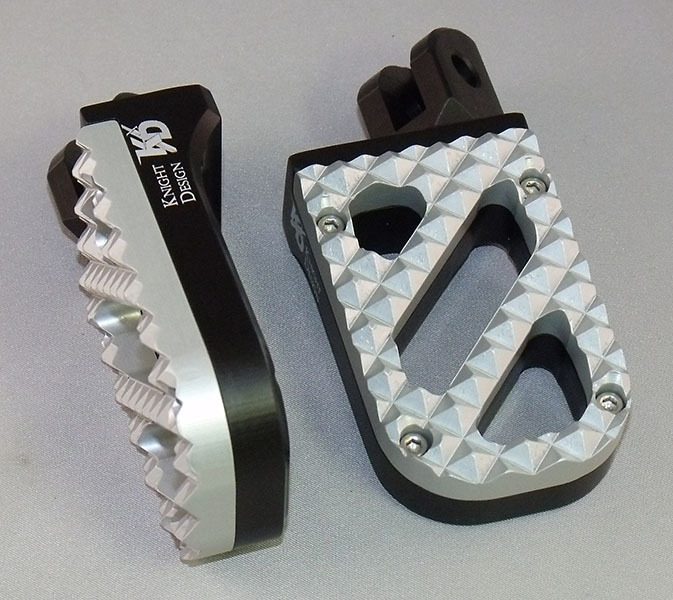 Sidetrax is a good street bike tread, with grip most similar to your stock foot pegs. If you like to move your foot around a lot while riding, this is the tread for you. Quadtrax is a high traction tread, with points on the top that grab onto your boot. This helps hold your foot still on the peg in all riding conditions. Rubber tread is offered on some models, for riders looking for better vibration damping. Hunter tread has traction points on the top These points grab the bottom of your boot, which is great for off road riding or slippery riding conditions. 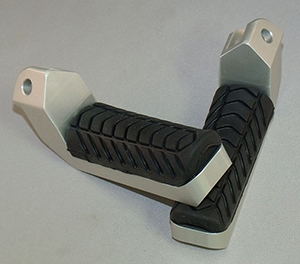 Trakker tread has pin grips for your foot, and is a great all around tread for street and dual sport riding. It you like to move your foot around while riding, you'll prefer the Trakker tread. All our foot pegs swing back like your stock pegs - important in case your peg gets close to the ground or another object. For most street bikes, the bottom tip of one inch lowered foot pegs sits at approximately the height and location of the tip of your stock curb feeler (the finger sticking out the bottom tip of your stock pegs). In this case, there is no loss of ground clearance with our lowered pegs. For dirt bikes, there is usually no curb feeler. Lowered foot pegs will be closer to the ground, and may make your pegs more likely to contact rocks and other obstacles when riding off road. This varies widely from bike to bike and rider to rider; please ride with caution until you get used to your new foot pegs. Most of our pegs mount with your stock foot peg pivot pin, spring, and retaining clip. Exceptions are listed for specific models. Installation is quick and easy: remove your stock pivot pin retaining clip, pivot pin, and spring, noting orientation of the spring. Remove your stock foot peg and replace with our foot peg. Reinstall your spring, pivot pin, and retaining clip. It is usually best to adjust your brake and shift lever downwards to work with lowered foot pegs. Some models have limited lever adjustment; please check adjustment on your bike prior to ordering; lever height varies a lot with personal preference. On some models, we supply a spring to use with our foot pegs instead of your stock spring. The springs we supply goes inside the mounting fork on the foot peg, and has one leg that rests flat against the bike's frame.